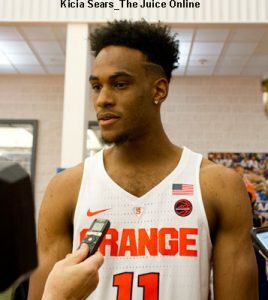 WHAT HAPPENED: After a Dylan Anderson free throw pulled Toledo to 44-41 with 12:25 left, Syracuse immediately responded with a 13-2 capped by an Oshae Brissett basket plus a foul to take a 57-43 lead with just over 8 minutes left. The Orange would lead by at least 8 points the rest of the way. ANALYSIS: This game featured a clash of different philosophies. Toledo head coach Tod Kowalczyk favors a high-powered offense, with his team shooting frequently and often from downtown. They came into this game taking about 40 percent of their shots from beyond the arc, and as a result were averaging 87.5 points per game. 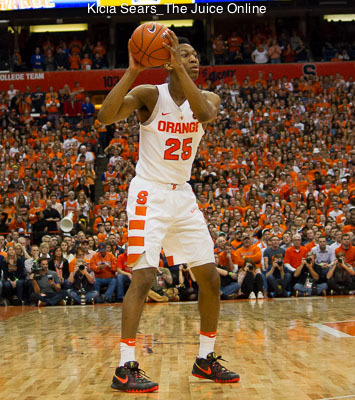 Meanwhile, Syracuse’s vaunted 2-3 zone had stymied its first four opponents this season, with its defense giving up just 56.0 points. Syracuse won this particular clash, holding Toledo to a season low in points, and clamped down late in the second half by limiting the Rockets to just one field goal over a more than 12-minute stretch. 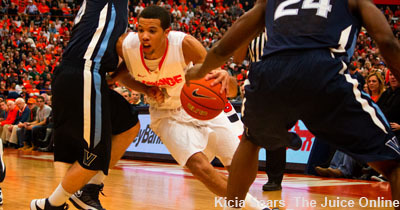 Overall, SU held Toledo to 34 percent shooting from the field, and was +18 in rebounds. HERO: With his backcourt mate hobbled (more on that below), Frank Howard picked up the scoring load, pouring in 25 points, and added 5 rebounds and 4 assists. Matt Moyer had the best game of his college career, chipping in 9 points and 7 rebounds. ZERO: Tyus Battle took a nasty tumble early in the second half and landed hard on his back. Though he stayed in the game initially, he was mostly ineffective and ended up sitting after an eight-point, 4-14 performance. He grimaced noticeably after several of his shots and elected not to stand during timeouts. Battle was diagnosed with a bruised back after the game. WHAT’S NEXT: Syracuse hosts Maryland at the Carrier Dome in the Big 10/ACC Challenge on Monday at 7 p.m. TV: ESPN2.